This thread is effectively a relaunch of the "Fictional Never-Were" thread from Warship Projects 3.0. Has been converted into a monitor. Hull dimensions are the same as the real ships. Propulsion: 2 Diesel engines driving a single shaft, maximum speed 12 knots. Plot Summary: Nazi Germany sends the Hindenburg to bombard Washington in 1945 (Unknown to the captain the real plan is to transport $89,000,000 worth of gold to the US.). The monitor battles with HMS Trent and sinks her by ramming. A mutiny then takes place after the crew discover the gold. The ship is abandoned in Greenland and lies abandoned until a Dot-Com millionaire salvages the ship so he can use it as the center-piece of a theme park he plans to build. After arriving at Washington the ship is boarded by a 'Sovereign Citizen' who somehow manages to fire one of the main guns at the White House (He misses). A Harpoon missile is fired at the Hindenburg by USS Clark (FFG-11) (A real ship. ), which explodes but does not damage the ship, however does it break apart after running aground after the tow ropes are cut. Note: This is the authors second novel, the first novel 'The Iron Man' (1998) is also covered in this thread. Surface armament has been augmented as follows, in addition to the standard weapons fit out the following weapons have been equipped, a quad-40mm gun mounted on the fantail, two twin-40mm mounts on the boat deck (Port/Starboard), plus 20mm guns at unspecified locations. Stats as per the real ships, electronics have been modernized. The air craft catapult has been replaced with SSM missile launchers of an unspecified type. Can handle both fuel and ammunition replenishment. Not a US Submarine, possible nationalities are British, French or Russian. Plot Summary: A beached USN captain is given the job of preparing a frigate for transfer to Pakistan during the buildup to Desert Storm. He instead finds himself sailing into stranger and stranger waters in the search for pirates in the South China Sea. Note: This intrigue heavy plot is perhaps the authors wildest foray into naval action fiction, whenever I read it I cannot stop myself from thinking of Douglas Reeman's 'The Greatest Enemy' (1970), another novel set in the same region of the world and drawing upon similar fears about China. Details as per the real ships in regards to dimensions and armaments. Plot Summary: The year is 1980, the USS Barrett (DDG-998), the newest ship in the US Navy has just entered service, provided the bugs can be worked out of her software, the ship may become the model for 21st Century warships, that is provided the Soviets don't interfere. Now from David Poyer's more or less plausable creations to something a little less plauseable. A rather vaguely described super-sub. Length is around 1500ft, the aft (two thirds of the distance from the bow) mounted conning tower tops out at most 120ft above the keel of the submarine. Hull width is unspecified. Armament: The usual stuff for an attack submarine, in larger quantities, plus a marine contingent with tanks and helicopters (no mention if the bow opens to deploy the tanks via a ramp or they deploy via heli-lift). Plot: The Russians try to make the entire Arctic Ocean their own lake. Autonomous underwater combat vehicle. Control system comprises a computer linked to a suitably conditioned human brain. Speed: Max: 30knots (+) (submerged), surface speed not mentioned. Armament: Torpedos and hypervelocity weapons referred to as 'Darts' and 'Bolts'. Also carries various decoys and can be fitted with manipulators and a pod to carry one human occupant at the expense of the weapons load. Hmmm, really scraping the depths of my memory here. A novel I think was called 'Fathom'. An optionally-manned minisub/UUV developed by the French code-named Green Dolphin. Standard techno-thriller plot: hijacked equipment, nuclear terrorism, race against time etc. Published some time in the first half of the 1980s? Google's not helping, so is anyone else's memory jogged? It's of interest because the Green Dolphin seems to anticipate a lot of current thinking. As mentioned, it is designed for covert military operations, large enough to carry one person if required (largely during testing and development), it can operate unmanned, autonomously for long periods, it has an internal pumpjet propulsor and an anechoic coat. Also, John Birmingham's trilogy beginning with 'Weapons of Choice' presents a whole fleet of futuristic but reasonably extrapolated vessels, too many to name and describe in one post. Mine is, I've actually read it, but I don't have a copy. The only thing I can remember from the plot is that when the agent sent to stop it finds the submarine the coating on the outside feels like flesh and the person manning it is found to be very dead. I'm wondering if those ideas were floating around (no pun intended) at the time. Much of the novel (after giving the backstory) is a series of slow, silent approaches to weaken the defenses of the target. Between pages 49-51 of the 1984 Panther edition (which may have been the only one) there is a pretty detailed 'data-dump', it might be enough for someone to run up an illustration. It's in a box somewhere, but it's been ages since I read it, and I don't remember the specs beyond it being a manned Slocum glider. The concept has definitely stuck with me. Stealth design with a clipper bow and a well deck. Armament: two 76mm OTO Melara Super Rapid guns, advanced Phalanx CIWS (4 x 25mm Gatlings plus 2 x quad Rolling Airframe Missile), torpedo tubes, and 196 cold-launch VLS tubes. Surface-to-surface: 36 Harpoon Two, 12 Standard HARM, 12 Sea SLAM, and 12 Strategic Cruise Missiles. ASW: 36 Vertical Launch ASROC, 4 Aquahawks (ASW Tomahawk). Surface-to-air: 48 LORAIN, 28 ESSM quad packs (112 missiles). Special-mission loads: 4 BRAVE 2000 drones and 1 Zenith anti-satellite round (this is stacked on deck for launch and said to take up 4 VLS cells). Note: Pennant is well outside the range of the Los Angeles Class (SSN-688 to 773 with gaps at 726 to 743 (Ohio Class) and 744 to 749 (Unassigned)). 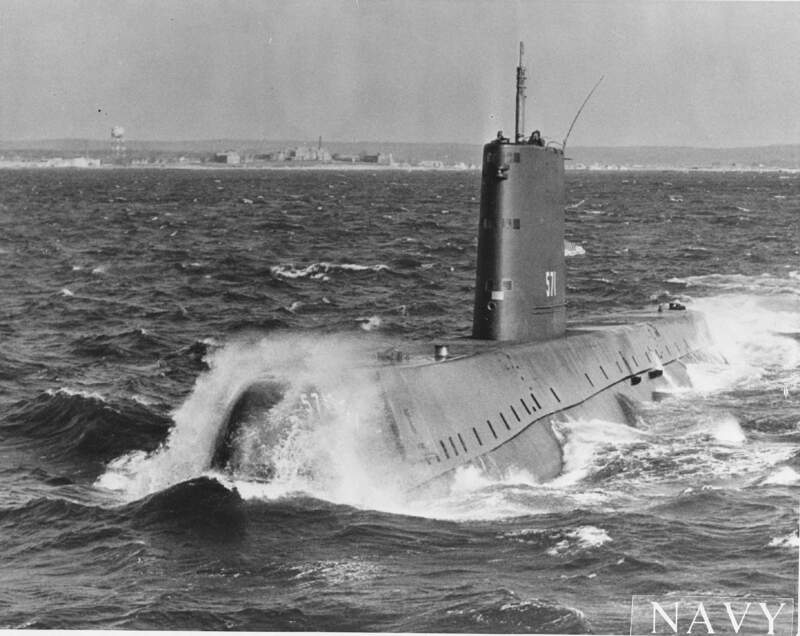 The number clashes with that of USS Diodon (SS-349) a Balao Class Submarine in service 1946 - 1971. Note: Undetectable by all but the most modern passive sonar systems, exactly how is not specified by the author. Different destroyers and convoy escorts. Nuclear Submarine, class not specified. Chinese submarine, class not specified, but may be a Type 033 (Romeo Class) or Type 03 (Whiskey Class). Plot Summary: The Royal Navy's newest submarine finds itself in the middle of an undeclared war between the United States Navy and the Peoples Liberation Army Navy. I've attached the cover of the 1973 edition of the novel as it is one of the instances of a cover artist (Chris Mayger(?)) clearly making an attempt to depict the main ship featured. Armed Merchant Cruiser operated by the Royal Navy's covert operations wing, the BMSNC (British Mutual Steam Navigation Company). Armament varies depending on mission, but can include guns, missiles torpedos and mines. For this operation the armament is a single 50-Mt nuclear bomb. Later:I've added a scan of the front cover of the 1981 paperback release of this novel. A rather impressive image of a Soviet Destroyer by Paul Wright. The full cover is linked below. it's dead crew and wreckage were recover and put in storage. Centuries later the pacified mankind resuscitated the crew and repair the Submarine. Plot Summary: An ageing Royal Navy frigate with a scratch crew finds itself caught up in an attempt to seize Majorca for the Soviet Union. Note: The cover of this book, while quite nice is also inaccurate, the artist (Kevin Tweddell) depicts the HMS Medusa as a Type 21 Frigate rather than the Type 12 Frigate the authors description clearly makes her out to be. The cover for the 2003 re-issue of the story paired with the authors 1960 novel The Doomed Oasis by artist Larry Rostant, is also inaccurate, while it depicts a scene from the novel, the ship depicted seems to be mix of several different country's warships, unless someone knows otherwise. Hull form: Implied to be Three-Island rather than All-Aft. Plot Summary: Colonel Gaddafi tries to get his hands on a large quantity of iridium, the key to a new form of fuel cell. Note: One of six American George Washington Class Submarines sold to the United Kingdom, other class members named in the novel are HMS Deterrant and HMS Massive. Plot Summary: The year is 1964. A British SSBN captain decides to carry out a live fire test of his submarines Polaris missiles. This one is definitely worth finding as it was born out of the controversies surrounding the cancellation of Skybolt and the American demands for a 'Dual-Key' system for Polaris. Cover for the 1979 paperback, which depicts an image that is probably quite disconcerting for American readers (Note the flag on the sub...) was by Paul Wright. Details as per the real ships. Aside from this detail, whoever designed the ship got the hullform right, she is one of the fastest sailing ships in the world, given that in the book she is chasing a ship capable of an average speed of 10.5 knots (Reasoning available on request) her average speed is probably pretty close to that. Armament: Probably the same as U-boats in the later stages of WWII. No surface armament. Appearance: Hullform probably not much different to a standard U-boat. Conning tower looks like an airplane wing. Plot summary: In 1941 a British submarine is given orders to hunt down and destroy a prototype U-boat that has the potential to win the war for Germany should it prove successful in combat. In 1959 the British submarines captain returns to the region seeking answers to events that occurred when he completed his mission. Note: As written above the novel indicates these events involving HMS Trout & NP-1 take place in 1941 or 42 at the latest. The novels briefing scene however contains references to Type XXI U-Boats and Walther propulsion experiments neither of which existed until 1943. It is of note that the film version of the novel released in 1968 moves the events to 1943. Note: I've managed to locate a copy of the 5th printing of the 1959 hardback edition, cover artist as for the first printing of 'Two Hours to Darkness' is John Rose. Details regards dimensions as per the real submarine classes (Whichever one the author intended.) The armament adds a retractable surface-to-surface rocket launcher mounted forward of the conning tower. Plot Summary: A disgraced RN captain tries to find redemption by bringing new purpose to the dispirited crew of an ageing frigate nearing it's pay off date. Note: This is the novel I always think of when reading David Poyer's 'China Sea' (2000). Thanks for sharing these again, I've long missed the original thread, and the rest of, Warship Discussion 3.0. Over at Shipbucket I've collected a list of fictional ships from books and film from a wide variety of sources, from old children's books available on Project Gutenberg, other maritime fiction sites, Wikipedia (the list there is now somewhat shorter due to over-zealous editing) and films I've come across over the years. The sources are not recorded in my list. Instead I've offered it as a "whatifian" library of names to show how these ships might fit into a 'real/alt-world' scenario and noting name clashes or naming conventions they don't meet and some basic descriptions where available and 'best guesses' to allow them to be slotted in for alternate history purposes. Generally I don't record obviously sci-fi vessels (1000ft long submarines etc.) or names like HMAS Bondi Beach for a carrier. There are no sailing ships either, that genre would add some considerable length! Interesting inventions like 1910 conceptions of what cruisers might be like in 1925 are listed and sometimes the odd aircraft concept gets thrown in too. Hood, thanks for linking to that and for preserving the contents of Wikipedia's list of Fictional Ships. If there are any on this list that have not appeared on yours feel free to add. BTW, do you know if anyone on Shipbucket has tried to do an illustration of any of the ships on the list? You may wish to amend the USS Barrett entry, it's definitely a Kidd Class. Fitted with a helipad large enough to take a Sikorsky MH-53. Plot Summary: A routine interception of an attempt to smuggle cocaine into the United States discovers a massive money laundering operation and leads to attempts to take a 'gloves off' approach to the Columbian Cartels. Truth is indeed often stranger than fiction! Single Shaft propulsion. Speed not specified. Plot Summary: Extortionists steal a nuclear submarine and make the usual 'pay me or I launch' demand. For my first post of the year, a novel featuring fictional ships from two eras. Details much as the original ships, save that she carries a flying boat (Described as an He-114), presumably aft, meaning that some armament located there may have been deleted to make room for the handling equipment. Only armament mentioned in the novel are the 2x 4.5in in the forward turret, 2x 40mm (STAAG?) aft of the emergency conning position, and at least 8 torpedo tubes of a size not specified but probably 21 in. Plot Summary: An amateur ocean scientists attempt to prove the existence of a warm current in the South Atlantic becomes tangled in a madmans attempt to find a long lost island and the mineral wealth it contains. An appearance of a fictional warship in a non-war novel loosely based on the Donald Crowhurst saga. Note: Class has been determined solely from the name. No specifics are provided by the author. As that person puts it when he reaches England, "Peeping Toms, aren't they - these submariners." Referred to in the first novel as "...the Coast Guard's newest supercutter..." and in the second simply as a 'cutter' the ship is diesel propelled and has a helipad aft, but few other details provided save that the crew strength is 177 (17 officers, 160 men). Armed Merchant Cruiser (AMC) operated by the CIA, converted from an Attack Cargo Transport (AKA), armament included unspecified missiles. Details are as the actual ships circa 1942. Author probably not aware that a Monitor of the same name existed in WWII. Cruiser - Class unspecified only detail provided by the author is that the ship is 500ft (150m) long. No other armament or armor. Plot summary: Following the Doolittle Raid on Tokyo and the Battle of Midway, Japanese pilots travel to Germany to train for a one-way strike against New York City. The attached cover picture depicts the moment the strike is launched. Details as per the actual ships presumably. Class name is not given. From the limited description provided, this ship would look somewhat like a cross between an Ethan Allen and a Typhoon, all the missile silos are on the forepart of the ship. Armament: 16 Polaris missiles. Unspecified number of torpedos (Some have nuclear warheads.) assuming usual SSBN practice only four forward facing tubes are fitted. Details as per the actual ships. Plot Summary: When a Lebanese gangster determined to get revenge for a British carrier strike on his headquarters manages to come into posession of two stolen Soviet nuclear weapons, the race is on to prevent their use. Plot Summary: The year is 1996. When one of the factions in the Liberian Civil War decides to specifically target Westerners, the Royal Navies newest warship finds itself fighting a battle more akin to those fought by the Navy on land in the 19th C.
Armament has been augmented with twin Exocet launchers aft of the stack. And for the aircraft mavens. Avionics: The aircrafts avionics system is highly automated and controlled by two computers. The first handles flight/avionics functions. The second computer is a Kamov T-VAC an AI system that controls all armament related functions in normal operation, but which can in an emergency situation control the aircraft independent of a human pilot. Description: "Totally black, it had no fuselage as such, but was one continuous wing curved like a boomerang. It spread 188 feet (57.3m), and the tips nearly touched the walls of the hangar. Astern of the root frame, two vertical stabilizers towered thirty-five feet (10.7m) into the air." Armament: The aircraft is armed by a directed energy weapon referred to as a 'Fusion Beam'. The weapon is powered by a miniaturized cold fusion reactor (Note: Cold fusion was a thing that was 'big' at the end of the 80s, it does not work.). As described in the novel the turret (mounted behind the cockpit) the weapon is mounted in can hit any target except for those in "...a six degree arc directly astern...", over-the-horizon targets can be hit by reflecting the beam off of a suitable surface. Note: The aircraft is a prototype of a class of aircraft intended as a 'stopgap' response to the American SDI program until large scale deployment of satellites armed with directed energy weapons is completed. The strategic reconnaissance capability is a secondary capability. Plot Summary: A Soviet stealth aircraft fitted with an experimental AI and an equally experimental beam weapon comes down in the Pacific Ocean after being attacked by a computer virus. Now on a war footing, the AI proceeds to defend itself against all comers. Note: Not the best of novels as the author has some strange ideas, notably that Exocets are AAW capable... The two Soviet cruisers are described as 'Slavas Class', I've made an editorial decision and assumed he meant Slava Class. Described in the novel as "...a second flight Yankee boat... with a patrol loadout of SS-N-6 mod threes." Plot Summary: A newly graduated US Navy ensign experiences both triumph and tragedy aboard an aging destroyer in the 1970's (The author never specifies the year, but probably after 1973.) The attached image is an artists impression of the USS Reynolds Ryan (DD-768) from the inside pages of my copy of the novel. Details for weapons as per the actual ships. Novel describes her as being fitted with some modifications to increase underwater stealth. Firstly the hull has been coated with a 'sound absorbing paint'. Secondly the sub has the ability to alter its hull contour with the aid of "...computer-controlled sheathing built into the exterior plates." Thirdly the conning tower has been reprofiled. Supposedly she can sail to within 500yards (460m) of an active sonar and not be detected. Gives speed (Not specified as surfaced or underwater) as "...over fourty knots." Details as per actual ships if you go by the class name. Armament adds anti-aircraft laser weapons. Author seems to have believed Oscar Class was an SSBN armed with 'SS-N-34' ballistic missiles. Plot Summary: In 1999 a massive underwater eruption causes the Ross ice shelf to break free of the Antarctic mainland and drift north. SSN, class not specified, referred to as "...the latest British nuclear submarine." Fitted with an experimental anti-sonar system codenamed "Leopard". Weapons fit probably not much different from actual British classes of the period. Details as per actual ships. Torpedo mix includes an experimental MIRV warhead designed to disable an opposing submarine by the use of cables to disable the propeller and a reduced charge warhead also intended to disable rather than destroy. Plot Summary: The Soviet Union succeeds in capturing a British submarine fitted with a revolutionary anti-sonar system, can she be recovered before it's secrets can be revealed. One of several novels I know of that were inspired in part by the 1976 Fort Dix Swine Flu outbreak. Four reactor powerplant, speed unspecified. Armament: 24 Trident Missiles, Unspecified number of torpedos, but probably only four forward tubes if standard practice is followed. Looking like the mother of all sharks as her two-story dorsal sail parted the waters, the nuclear submarine shot forward. Plot Summary: The year is 1992 and a cabal in the United States Government attempts to use a genetically engineered plague to take control of the worlds resources. Converted 12,000 ton freighter, three island design. Highly automated. 15 man crew. Armed with 'Hyperion' missiles, other armament and details not specified. Referred to as both a 'Frigate' and a 'Cruiser' in the book. Plot Summary: When the United States Navies newest nuclear submarine goes missing, who do you call...? Note: Finally managed to find the hull number for the USS Starbuck after 33 years, though I've always been amused by the depiction of the Submarine as a Skipjack with hull number SSN-107 on the cover.